Martin Panamick was a young Woodland artist. 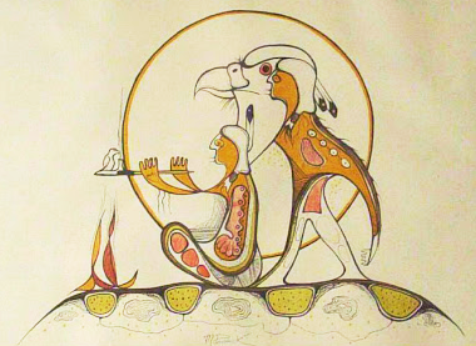 Martin Panamick, born in 1956 in West Bay on Manitoulin Island, was one of the original young people who participated in 1966 in the Manitou Arts Foundation summer school on Schreiber Island. The summer program had started in response to Norval Morrisseau's artistic success in Toronto. Morrisseau's friends Daphne Odjig and Carl Ray decided to encourage young people to consider a career in the arts. They organized the summer program on Manitoulin because Daphne herself had grown up in Wikiwemigong. Martin had a short life. He was killed in a car accident in 1977 but before his death had made a significant contribution to the Ojibwe Cultural Foundation in West Bay where he was born. His designs were used in educational material such as Why the Beaver has a Broad Tail and Ko-Ko-Ko the Owl. He also was contracted to create images for commercial ventures such as hasty notes and calendars. His brother Stanley credits Martin's enthusiasm and encouragement as the foundation of his own career.